GScanTM Kits contain optimized PCR amplification reagents and a wide selection of fluorescentlabeled primers for genotyping after PCR using fluorescent genetic analyzer instrument(s). Kit includes sufficient reagents for 100 detections. Genotyping using this kit requires use of the appropriate fluorescent genetic analyzer instrument(s) and software capable of detection of fluorescently labeled fragments of varying lengths. 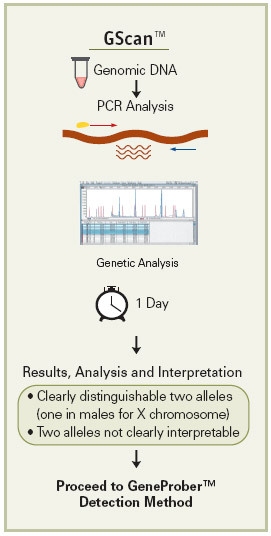 These kits have been optimized for an ABI310 genetic analyzer. Gene Link&apos;s GScanTM gene detection kits are safe, convenient and sensitive, and afford automated compilation of data. The kits contain optimized PCR amplification reagents and a wide array of fluorescent-labeled primers for genotyping after PCR using fluorescent genetic analyzer instrument(s). Included in these kits are ready-to-run control samples of various repeats of the triple repeat disorder. These control samples are for calibration with the molecular weight markers for accurate size determination of the amplified fragments. The GScanTM Kits are simple and robust for routine triple-repeat detection of greater than 100 repeats of all triple repeat disorders listed, except Fragile X. The CGG repeat in Fragile X can be detected up to ~50 repeats. It is strongly recommended that the genotyping be followed up by using Southern blot detection methods when two alleles are not clearly discernable. Product Size Catalog No. Ordering Info.